Nikon's Action EX - Extreme All Terrain Binoculars - are designed to appeal to optics users who value tough construction and reliable optical performance under even the most extreme conditions. 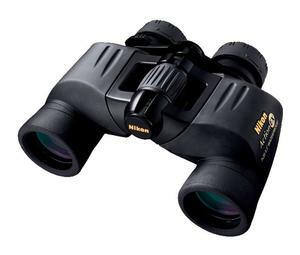 Nikon Extreme binoculars feature an all-metal chassis with lens fittings housed in a tough, lightweight polycarbonate body shell. Like all Nikon All Terrain Binoculars, the EX is nitrogen-filled and O-ring sealed for total waterproof, fogproof and shockproof performance in any environment. The binocular bodies are ergonomically shaped, tripod adaptable and rubber coated for a non-slip grip, whether wet or dry. The Action EX series binoculars each feature a unique, click-stop eyecup design that not only delivers long eye relief, but also allows for variable eye relief that is customizable to the user's own eyes and eyeglasses. The binoculars are central focus with a diopter control to correct for normal right/left eye vision imbalance. Update:&nbsp;I based my choice partly on authoritative reviews of this and other members of the Nikon Action Ex series. Unfortunately, since these were written it appears that Nikon has economised on the lens coatings, in that only one side of the objective group is coated, resulting in poorer optical performance.&nbsp;While they probably remain adequate entry-level instruments, I would not particularly recommend them. Great Service. Ordered Sunday evening, package arrived Tuesday. Very well packaged and courier sent me a text on Monday,service doesn't get better than this. These binoculars are amazing. Great eye relief for us spec wearers. Image is very clear, really good light gathering..build quality is excellent. I think you would have to spend several hundreds of pounds to get a pair noticeably better. Would be a good buy at &pound;150.....and absolute bargain at &pound;90! Robust, comfortable, easy to use good value binioculars. Highly recommended. Excellent delivery service, delivery window so useful. I spent a great deal of time trying out binoculars at a local store and the looked on line for the best value deal. It was Uttings by far. The binoculars are superb and simple to use. Added to this was the excellent, speedy delivery service - Uttings sent me a text giving a delivery window and this was met by the courier. Truly exceptional service.